First mention found of Ralph Wrinkle was in National Hillbilly News in early 1949 in Arlie Kinkade's column. He was summarizing who was appearing on the Saturday night jamborees over radio station KWLT (actually KLWT) in Lebanon, Missouri. 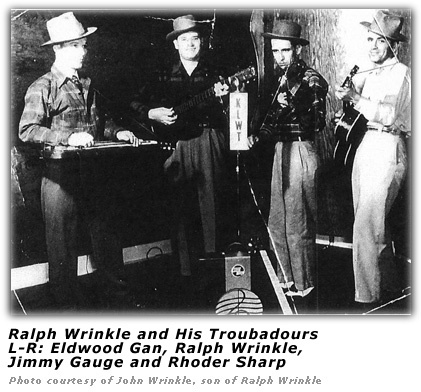 He of course mentions Ralph Wrinkle and His Troubadours. He also lists Helen and Toby, Charlie Jones and his Missouri Mountaineers, Wee Willie Wilson's Ozark Ramblers, and Ken Corbett and Sonny. In the fall of 2018, we heard from Ralph's son, John. He provided us with more information about his father's career as well as the show. John Ralph Wrinkle was the son of Houston B. and Melinda "Betty" (Evans) Wrinkle. His siblings were Minnie, Virgil and Charles. Per the US Census of 1910, the Wrinkle family was living on a farm in Rogers, Oklahoma. The family later moved to Lebanon, Missouri. Ralph's father than took a job as a road construction worker. On August 27, 1938, Ralph married Geneva Jones. On July 18, 1944, Ralph enlisted for military service at the Jefferson Barracks at the rank of Private. At the time, he was working for Charles Johnson as a shoemaker and shoe repairman. 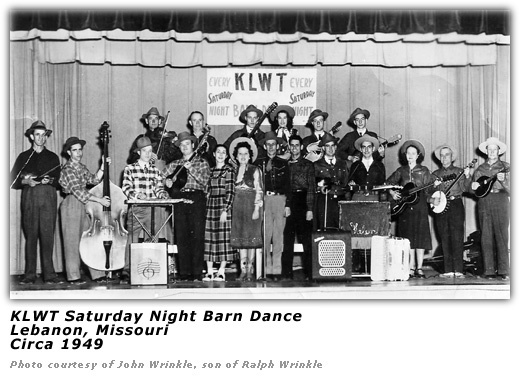 The KLWT radio program was the first country western live program in Lebanon Missouri. It started every morning at 5:00 am for an hour. My father had guests who appeared on the program. Bill Monroe, Ernest Tubb and Tex Ritter are three that John can remember (he indicated he was 5 years old at the time). Doing some further research, we found that the show began possibly in early December 1948. It was led by former rep and tent show performers Helen and Walter (Toby) Price. The Billboard article stated that the local "The Lebanon Daily Record" lauded the show over the "...good, clean fun" and the "...smooth direction of the attraction by the Prices." The members of the Barn Dance in early 1949 included James Thomas, Clem Stretch, Sunny Stiles, the Pratt Brothers. It was said dairy farmers through out the Missouri area bought radios to put in their barns to listen to the music while they were milking. The Ozark Troubadours led the way every Saturday night at the KLWT barn dance, they are the first four on the left in the photo. There were many singers who came to the popular barn dance. Acts such as June Carter and the Carter family came at least one Saturday a month. Many singers were simply trying to be known came and joined in the Saturday night singing and playing. The show was recognized nationally in Billboard magazine in their December 25, 1948 issue, which essentially confirmed what was in Arlie Kinkade's article mentioned earlier. In early 1950, Billboard mentioned he had appeared on the Helen and Toby Price show over KGLC in Miami, OK. The family moved from Lebanon Missouri to Hobbs, New Mexico in 1955. 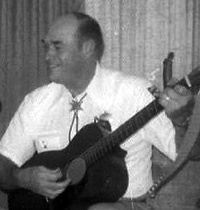 Ralph Wrinkle continued singing where ever he was asked to perform. 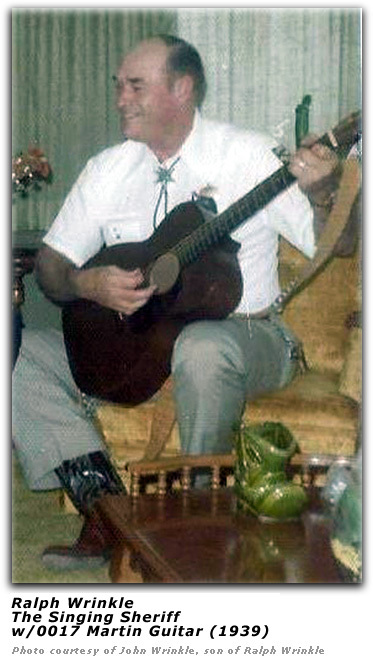 He was elected Lea County Sheriff in 1973 and was quickly named "The Singing Sheriff". "The first time I met Sheriff Ralph Wrinkle, he was seated behind that large stately mahogany desk, which at times seems to overpower the rest of his warm, down to earth, inviting office. As Sheriff Wrinkle rose to shake my hand, I noticed he was muscular in stature and there was an aura of strength and confidence surrounding him, which one acquires from serving in a position of trust and being constantly in the public view. In no way was this man just another government bureaucrat. His handshake was warm and sincere, and a smile that said "Welcome" more than a thousand words. I noticed right off the guitar standing in the corner behind his desk. That's when I thought to myself, "There's a whole lot of country to Ralph Wrinkle." I commented on the original looking flat top guitar (Note: Ralph's son, John, stated that the guitar mentioned was a 1939 0017 Martin and he still has it and plays it.). Ralph grinned, and said, "I'm really a hillbilly transplant from Laclede County, Missouri." Upon my request, Sheriff Ralph Wrinkle picked up the "box" as he called it, and strummed a few tunes, and after hearing him vocalize, I found that Ralph had a very nice melodic set of vocal chords. Since that meeting in February 1975, Sheriff Ralph Wrinkle and I have become very personal friends. He and the Lea County Sheriff's Department have sponsored my show several times benefiting the Lea County Child Development Center. The singing sheriff has appeared and performed on each one of the "Benefit Shows." His musical talents have carried him all the way from Lea County, New Mexico to Nashville, Tennessee, where he recorded a single 45 RPM record. He wrote both the songs, "Walk A Little Plainer, Daddy" and "A Walk With Jesus." He also did a guest appearance on the stage of our "Music City Country Music City Jubilee, Inc." on Music Row. He had planned to do one song, but the audience would not have it that way. After grinning his unique grin, and bowing several times, he honored the encore with the inspirational song, his composition. This was while was in Nashville attending the Law Enforcement Business at the 1983 National Sheriffs' Association Conference." The local Hobbs Daily News-Sun wrote about his recording session in 1976. He was to be backed up on the recordings by either the Stamps Quartet or the Singing Christians. Wally Fowler was to direct the session. Mr. Fowler had also conducted the "International Gospel Music Festival in Lea County in 1975. Mr. Wrinkle also appeared with other acts such as the Stamps Quartet, Wanda Jackson, the Singing Christians and the Fowlers of Florida. In 1976, he had reached the statutory limit of two terms as sheriff in Lea County and could not run for re-election. Hillbilly-Music.com would like to express its appreciation to John Wrinkle, Ralph's son, for contacting us and providing information about his dad's career and several pictures.